WCCUSD Superintendent Matt Duffy described the district’s strategic Roadmap 2022 as a way of summarizing the key features of the much more comprehensive state local control plan (the L-Cap). He indicated that the district started with aspirations and set ambitious goals: specifically that in 5 years, our district of achieving students, engaged communities, and invested employees will graduate 80% of students college-ready; 80% of parents and students will report high levels of satisfaction; and 80% of employees will stay with us for at least 5 years. Significant obstacles to this remain since, for example, currently only 3 out of 10 3rd graders are reading at grade level and only 4 out of 10 graduates are college-ready. 1. How do you compare the needs of the Adult School students with those of the Mandarin school program that displaced them? The Mandarin School is now using 3 classrooms at the Adult School. We know the Mandarin School can’t stay at Sierra, so the question is how long will it remain there. 2. What’s the status of funds for Fairmont Elementary? Fairmont has dollars in the current bond program, but only for critical needs, such as expanding the school area toward BART. Dollars to actually rebuild would require a bond measure. 3. The city of El Cerrito has recently approved new housing developments. How will new housing translate to newly arriving students at El Cerrito schools? We are looking at how many new kindergarteners came in this Fall as a test. We did see some increased enrollment at Korematsu, but only tiny growth at El Cerrito High School. 4. How are district finances impacted by charter schools? Dollars travel with students, but it’s hard to reduce commitment to teachers in proportion. For one thing, we have a retiree liability of $667/per student ($20M/30K students). 5. What will be the effect of additional charter schools on enrollment? It’s unclear if we will lose students and where we would lose them from. For example, to date, Richmond High lost a lot of students to charter schools, as did Lincoln Elementary. But it’s unpredictable where future losses would be. 6. What is the status of teacher retention? I’ve pinned my future on teacher retention. We did exit interviews with departing teachers this summer. They say they left because of 1) compensation issues (dollars for salaries and professional development being lower in non-charter schools than in charter schools); 2) culture; and 3) working conditions (e.g. supplies, heating/cooling). The board has ratified more compensation. 7. Do you have a goal of creating more K-8 schools? Yes, research shows the value of K-8 schools. But since we are losing kids at grade 9 (e.g. Kennedy High, Richmond High,) we’re also exploring the benefit of K-5. Many communities are using the K-5 model. 8. Will there be a special needs school at the former St. Jerome’s location? 9. How are you ensuring students have adequate access to teachers and staff of color? We have discussed how to recruit a diverse workforce. 10. What is District position on using vacant schools, such as Adams? Adams is not earthquake safe and a seismic retrofit would be very costly. By the way, charter schools can build to a slightly different standard. Alvarado, for example, is not in condition for students (e.g. no kitchen) and would cost millions to put back in condition. 11. How does the district ensure funds are spent for the intended purpose? There is a district L-Cap committee and the county Board of Education monitors our spending. 12. The district set a teacher retention goal of 5 years. Why not longer? I don’t know if, in future, there will be 30-year teachers. We are seeing a part bell curve where the bulk of teachers have either less than 5 years of teaching experience or greater than 25 years. 13. Our Fairmont principal could use an assistant principal. How did the district prioritize funding assistant principals at some schools? Where there were 500 or more students and an unduplicated count of low income students, that was where we put the assistants. We are looking at the next iteration. 14. How can you avoid pulling students out of class for music lessons? The question is money. I’m a fan of music and would like to get out of the pull students out of class model. For high-achievers, or students who have an instrument, leaving class is less of a problem. 15. Why are kids leaving the district? They say because of 1) safety and 2) rigor. 16. How can the district achieve its goals for minority students? We want accelerated goals for minority (Black, Latino) students. We are tracking their scores. 17. What is happening with funding for the visual and performing arts? We are keeping the resources we have. I was a member of the board’s Governance subcommittee. We saw rising dollars for school board races, including the influence of super PACs with deep pockets. People are concerned about this principally because it would mean that individual board members who receive charter school campaign funding could represent narrow interests in the district. The current board’s Governance subcommittee is talking about a $1K campaign limit that would apply to non-PAC contributions. I opposed this because this control cannot touch PACs which have unlimited campaign funding opportunities to influence a school board ele ction. And that unlimited funding means heavy influence by charter schools which will hamper individuals not supported by charter school funding. Moreover, large amounts of charter school funding going to a few school board members will mean that ordinary people cannot run for office. They will lack the funds to compete. In my case, in 2012, I raised $12K and spent $4K. Going to a ward structure (as has occurred in Oakland and LA) does not help board members and the public have a greater voice. WCCUSD Board member Val Cuevas asked to respond. At this point, other board members excused themselves from the room to avoid any Brown Act issues. On Wednesday, August 30, 2017, El Cerrito Democratic Club members hosted over 30 activists from at least 5 East Bay Democratic clubs for a seminar on how clubs can be catalysts for victories by Democratic candidates in primary elections and passage of progressive policy goals. Our speaker was Hans Johnson, founder and president of the East Area Progressive Democrats (EAPD) from Eastside and Northeast Los Angeles. Hans gave a thorough summary of the work of EAPD, just over 3 years old but already with 800 members. His anecdotes detailed how club leaders engaged Democrats in an area where party institutions had formerly ignored grassroots activists, their diversity, and untapped capacity. As a result of the club’s sustained advocacy, L.A. City and the state of California took bold action to stop blight in rivers and neighborhoods caused by throwaway plastic bags, and led the transition to reusable bags and biodegradable packaging that reduce waste and dumping. EAPD played a pivotal role in both passage of SB 270, the statewide plastic bag ban, and protecting it through a statewide campaign that defeated the related Prop 65, and approved Prop 67, on the November 2016 ballot. Many of the activists in attendance were especially interested in Johnson’s explanation of how current State Controller Betty Yee benefited from ardent club support in her narrow June 2014 primary victory over Assembly Speaker Emeritus John Perez. While such a razor-thin margin is unusual in statewide races, it prefigures outcomes we can anticipate from Democrat-vs.-Democrat contests as the top-two primary becomes embedded in our state and statewide elections. Club support will be an indispensable part of the strategies for winning these narrowly decided victories. While Democrats in California have and should retain a strong grip on the levers of state legislative and political power for the foreseeable future, we still face the challenges posed by Citizens United and unconstrained corporate spending for independent expenditures. In the face of such threats, our own party’s complacency can result in lackadaisical party operations, allowing moderate Democrats to gain traction and hamper implementation of our progressive party platform. Hans discussed some nuts and bolts of growing and leveraging Democratic clubs’ clout, by building and maintaining lists and sustaining regular communication. He stressed the importance of using clubs’ influence in primary elections, often decided by turnout at just half or a quarter of general-election levels, but which determine which Democrat advances to that showdown. He encouraged vigilant clubs to endorse early, coordinate with each other, and increase influence by developing a strong press strategy, including op-eds and blog posts amplified through social media. This lively discussion featured questions and ideas from club presidents and a candidate in attendance. 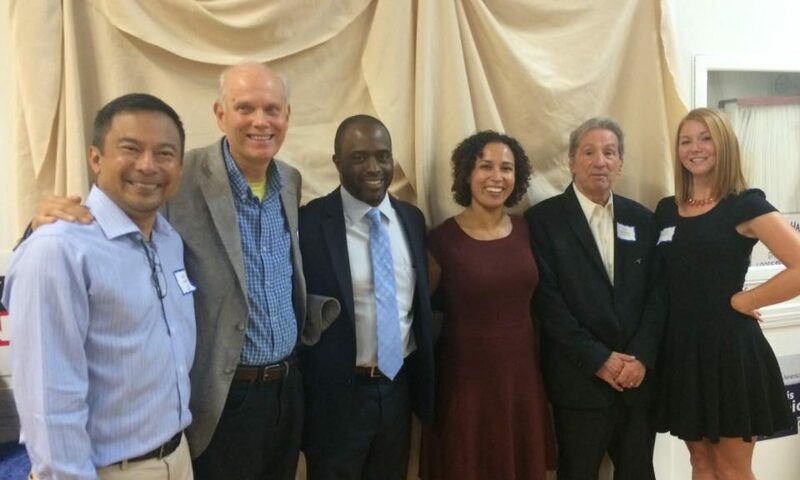 The evening’s program also highlighted the richness of East Bay Democratic organization and our emerging diversity. We should continue to work together to engage bystanders and register and re-register voters and inculcate progressive values in the party by encouraging and recruiting capable and proven party activists from diverse backgrounds to run and serve in the party structure. In this way, and several others, the grassroots are reshaping our party and rewriting the playbook for building and using the power of our party.